There is something remarkably comforting about a hot breakfast. I need coffee just to get myself started in the morning. On a cold morning like this one, a hot breakfast helps me ease into the day. 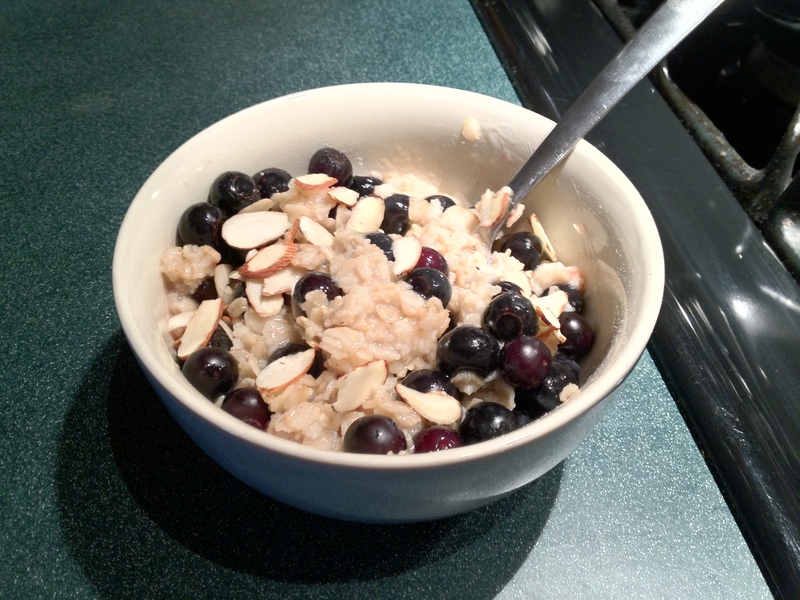 Oatmeal does the job: it’s easy to make, takes very little time and warms the belly. It’s also a breakfast you can feel good about, packed with nutrients, health benefits, and the filling-power needed to keep a grazer like me satisfied till lunch. By itself, oatmeal can be more than a little boring—bland and a bit soupy. With the help of a few friends—fruit, nuts, brown sugar and cinnamon—oatmeal gets a boost in flavor and texture. Plus it makes you feel like you’re eating a real breakfast, instead of a bowl of blah. And no one wants to start the day feeling blah. My method: Cook the oatmeal as directed on the package. Turn off the heat, and add the flavor: cinnamon (a sprinkle), brown sugar (about a teaspoon), and the fruit (I like a lot, so I add about a cup). Cover and let rest for about 2 minutes, then serves with a sprinkle of chopped or sliced nuts (this morning, it was almonds for me). Eat happily. You’re ready to conquer the day. This entry was posted in Musings, Recipes and tagged breakfast, cereal, easy, filling, fruit, healthy, high fiber, hot, nutrients, oatmeal, photo, quick, recipe. Bookmark the permalink.